Alcohol has always been a popular beverage amongst our community. It is an expected accompaniment at most, if not all social engagements. Alcohol is the legal drug of choice that most adults have indulged in at one time or another, either for enjoyment, celebrations, relaxation or escapism. We all understand and many have experienced the harmful effects of excessive alcohol consumption. On the other hand moderate drinking can promote certain health benefits, but there is a fine line between the two. Everyday someone will ask me if alcohol is fattening and how much can they have without sabotaging their efforts. There are many factors that effect the answer to this all too popular question. First of all we must understand that all alcoholic drinks contain energy. To lose weight a person must consume less energy than they use on a daily basis. Therefore the consumption of alcohol will not contribute to weight gain if the total daily energy intake does not exceed the total energy used by the body. On the other hand, which is often the case, if the extra calories consumed from alcohol pushes your energy intake above what is used, weight gain will occur over a period of time. Alcohol is very high in energy, each gram has 7 calories. Fat has 9 calories per gram and both protein and carbohydrates have approximately 4.5 calories per gram. You can see from an energy perspective alcohol is up there with the best of them. Add a sugary mixer like cola or orange [ see table 1] and you can triple the energy content of a standard drink, easily contributing to an excess in calories. Alcohol without getting too technical slows down the fat burning process. Two standard alcoholic drinks [ see table 2 ] can reduce fat metabolism by 73%. 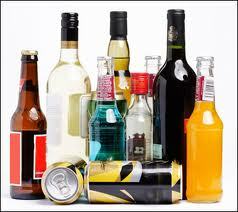 Our bodies have no where to store alcohol, being a toxin our bodies metabolize it first preventing fat from being used. Only 5% of the alcohol we consume gets converted to fat, the rest is converted to a substance called acetate by the liver and then released into the bloodstream. This acetate puts the brakes on fat burning until the muscles in the body have used it up as fuel. Alcohol is usually consumed with high fat meals or snacks like chips and peanuts which enhances extra fat storage. Alcohol stimulates the biomechanical pathways involved in appetite control making it easier to over eat. The more alcohol you consume the less movement you participate in, therefore decreasing energy expenditure a main ingredient in weight control. The more you drink the more you compromise your ability to control overindulging in further alcohol consumption and over eating because alcohol decreases inhibition and self-control. Fortunately it’s not all bad news, you don’t have to give up all the good things in life to lose weight. You can still enjoy a drink but you will need to trade it off by further reducing some extra food or increasing the amount of exercise you do. As a general rule one 10-gram alcoholic drink [ see table 2] requires at least a 10-minute walk to neutralize the extra energy consumed. [ longer if you add a mixer like cola or orange] If you have 4 standard middies you will need to walk for at least 40 minutes before you start to tap back into your fat stores.